Teacup Travels has a brand new adventure on the CBeebies Storytime app! We are delighted to announce that Teacup Travels now has it’s very own story on the CBeebies Storytime app. 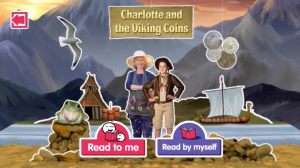 ‘Charlotte and the Viking Coins’ can be downloaded from the storytime app ‘Library’ and kids can even have it read to them by Great Aunt Lizzie herself!